St Nicholas is fortunate in having an excellent ring of 8 bells, a number dating from the Seventeenth Century. There is an enthusiastic team of bell-ringers drawn from the Parish and surrounding area, who ring on Sunday mornings and for weddings. We practice on Wednesday evenings at 7.45pm and all are very welcome to join us. 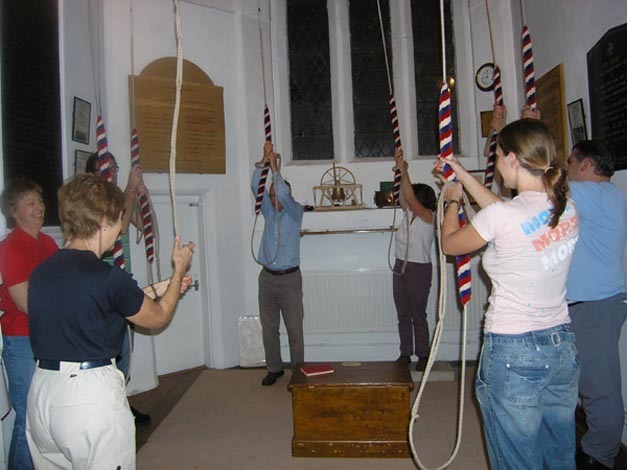 If you haven’t rung before and are interested in becoming a bell-ringer, particularly if you would be available to ring for the Church service and at weddings, do come along and speak to our Tower Captain, Andrew Gordon or Ringing Master, Phil Murphy – 372319. We have members at all stages in their experience, including a number of beginners and you will be very welcome. We often start early at 7.30pm for beginners to ensure that they can have the individual attention they need when they are starting out. If you are an experienced team and wish to visit the Church to ring the bells, as many teams do, please contact Gez Scrivens on 752569 or gezscrivens@gmail.com or complete the form below giving at least 2 weeks notice as this is a busy church.